Soggy sneakers, boots, and other shoes have met their quick-drying match. 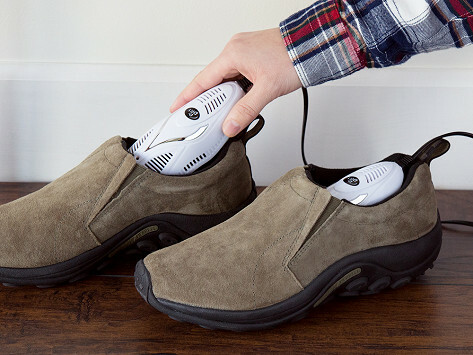 In around four hours, this electric shoe dryer dries out wet shoes—even ski boots—while the integrated UV light combats odor-causing bacteria. Dimensions: 8.5" x 6.5" x 2.5"
These were gifts for my daughters as they are runners and often need to dry out their shoes. Bought as a xmas gift. He says one is noisier than the other after 1.5 months, but still working. Works so well. Glad I got it. Not only does a great job drying but keeps it smelling much better too. 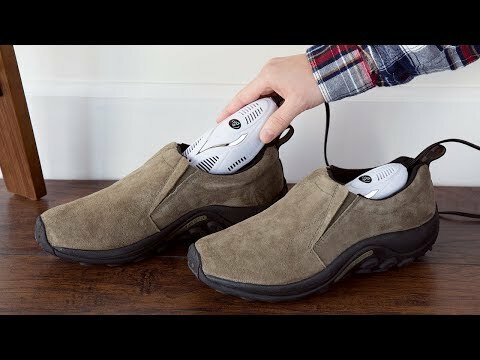 This electric shoe dryer and deodorizer dries out sneakers, shoes, and even ski boots while fighting odor-causing bacteria, too. Each shoe-shaped dryer has a built-in fan that helps circulate the hot air, drying shoes in about four hours (much faster than air drying!). Plus, a UV light deodorizes and disinfects the inside by thwarting odor-causing bacteria. It’s much more effective and a lot quieter than using a clothes dryer. After an appointment with Dr. Dry, your kicks will be dried out, and smelling cleaner, too.